Rekindling the critical analysis of the adoption of generic commercial (for-profit) management approaches in the non-profit context, Strategic Positioning in Voluntary and Charitable Organizations reveals that charities are positioning themselves in their evolving external environment in distinctive ways that are not adequately explained by existing positioning theories. Based on original research that examines, for the first time, the usefulness of contemporary theoretical perspectives and interpretations of strategic positioning derived from the existing literature in explaining the positioning activities of charitable organizations within the wider voluntary and non-profit sector. • an exploration into the extent to which existing strategy/marketing literature on positioning is applicable in the charitable context. 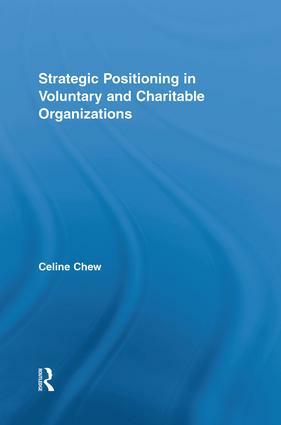 By challenging the adoption of current perspectives on strategic positioning derived from commercial strategy and marketing management literatures into the non-profit and non-market contexts, the author develops a theoretical framework that accounts for the uniqueness of positioning strategy in the non-profit sector. This uniqueness is attributed to the difference in positioning goals, the process of developing a positioning strategy, and the influencing factors on the choice of a positioning strategy in charities compared to commercial organizations. The implications of the findings provide useful lessons for managers of voluntary and charitable organizations in planning and developing their positioning activities, and for other stakeholders, such as policy makers, funders, donors and industry bodies.